When it comes to smuggling, not all mules are created equal. 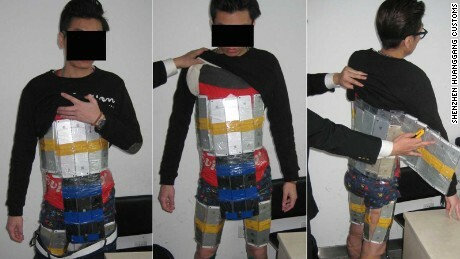 Chinese customs officials on Sunday busted a Hong Kong man trying to sneak 94 iPhones into the mainland -- by strapping them on his body. The man caught the attention of inspectors at the Futian crossing in Shenzhen, a southern Chinese metropolis bordering Hong Kong, when he walked like someone carrying a heavy load despite appearing to travel light, customs officials told CNN on Tuesday. After finding nothing suspicious in his two plastic shopping bags, officials asked the man to pass through a metal detector -- and the alarm went off. Photos released by customs authorities show dozens of neatly shrink-wrapped shiny iPhones strapped around the man's chest, abdomen, crotch and thighs with duct tape. Officials discovered both the iPhone 6 and iPhone 5S models and estimated the total value of the devices to exceed 300,000 yuan ($49,000). The man -- whose record revealed numerous previous run-ins with customs regulations -- was held for further questioning.